Neev-Ya Hadas Durban, the youngest child of Rachel and David and brother of Leead, was born in Cambridge, England on September 18, 1977, during the time his parents were on a Sabbatical year. In 1978, he went on with his family to the University of Harvard in the U.S.A. In 1982 and 1987, he returned to Cambridge, England with his family for periods of one year, respectively. Early on in his childhood, Neev-Ya's special character traits captivated all those who knew him; personal charm and sensitivity to others, reasoning and wisdom well beyond his young years, an insatiable curiousity, a unique character and unconditional love for family and friends that knew no boundaries. A fourth grade classmate at Herzel Elementary School recalls: "his captivating charms that shone through at the tender age of 10…an angelic face, beautiful eyes." A friend from the seventh grade at Hay Municipal High School adds:"I sat next to him for a year and a half and it was an extraordinary experience…and what was so special about him was his acceptance…Neev-Ya accepted every person just as he/she was. This is a wonderful and exceptional characteristic." As a muti-talented youth, Neev-Ya played the flute for 8 years. Throughout the same period of time, he constructed and flew model airplanes from a very early age. During his studies in high school, he developed a wide-ranging knowledge of aeronautics, interest in robotics and delved into special inventions and patents. In 1995, Neev-Ya completed his studies at high school and was matriculated at the highest level in natural sciences. 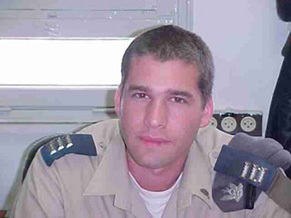 The following is an excerpt from an eulogy given by his high school teacher : "All those values, the qualities that we wish to see in people around us such as respect, the sanctity of life, love of Israel and its landscapes, man's responsibility to the living and non-living environment, tolerance and openess, sensitivity and belonging are all embedded in you. Your intellectual and creative abilities and talents along with your values could have laid the foundation for you to be a leader among us." The interest and enthusiasm that Neev-Ya showed for other cultures intensified throughout the years. He frequently travelled abroad with his family; in 1990, a trip to England to celebrate his Bar Mitzvah, in 1992, a family trip to France and a boating adventure on England's rivers. In 1994 and 1995, Niv-Ya travelled with friends to Sinai and Greece. After graduating from high school, Neev-Ya was accepted to the Technion to study in the Aerospace Engineering Faculty within the framework of the Israel Defense Force`s academic reservists program. His multi-faceted creations and leadership ability bore great fruit with ensuing manifold accomplishments. He presided one year as the student body representative and was a member of the faculty committee. He was a part of the editorial staff and a writer for the student newspaper "Kooli", and a writer and performer in the Student Theater. In addition to all these activities, he supported himself by working as a gardener, giving private lessons in physics and mathematics to students having difficulties and serving as a senior instructor of aeromodelling for the "A. Aviation and Space Company". In 1997, he conceived, initiated, and organized the "EggCopter" Competition among the Technion students. The goal of the first competition was to design and construct a device that would enable an egg dropped from a height of 40 meters to land in the least amount of time without breaking. The challenge required creativeness in design and implementation. The event attracted numerous participants and drew extensive national and international televised media coverage. This paved the way for the traditional competitions at the Technion called "TechnoBrain" . Two years later in 1999, Neev-Ya created and organized the "TechnoBrain 2" Competition called "Candlemobile". This challenge entailed designing and constructing a vehicle to travel the longest distance possible by means of a unique source of energy – two burning Sabbath candles. This competition also achieved great success and Neev-Ya was requested to design a similar exhibition for the National Museum of Science in Haifa (Technoda). Following the "EggCopter" Competition, the presiding president of the Technion at that time wrote that "all the Israeli and International mass media attended the competition and there were responses throughout the world. Its success was so great that we have decided to make it an annual event because it encompasses all the elements that make engineering creative, fascinating and attractive. During the competition I saw Neev-Ya cope with the competitors, the audience and the mass media with talent and skill. From this unique experience it was apparent to me that he was enormously gifted." Throughout his studies, Neev-Ya was very conscientious about participating in and improving his hobbies of cliff climbing, diving, hiking, sailing, martial arts, learning first aid, photography and developing his own pictures and more. A classmate at the Technion eulogized him by saying: "Neev-Ya was a special human being, extraordinary. Beyond his personal traits of wisdom, rare honesty and kindness, he always wanted the best for everyone. Neev-Ya was the embodiment of enormous creativity with boundless charisma which transcended others." Another student close to Neev-Ya added, "One of the very best. Everything that you touch turned into something great. You gave us so much happiness and laughter. You enriched us with great inspiration." In 1998, Neev-Ya was named the outstanding student of the Technion. In 2000, an award was bestowed upon him for excellence in "Goliath", in a competition of the final project of the faculty's graduating students at the 40th "Israeli Conference of Aerospace Sciences". An aeronautical engineering project that Neev-Ya had charge of in the army was chosen as the outstanding project of the air force during the period of 2000-2001 and Neev-Ya himself was selected as the outstanding officer for 2001-2002. A special technological development that he worked on during the last years of his life passed successful test flights in 2004. Neev-Ya's travels abroad carried on successively – (Italy in 1997, the U.S.A. in 1998, Ireland and Scotland in 1999 and Prague in 2000. A journey to Africa in 2001 included an ascent to the peak of Kilimanjaro. In 2002 he travelled to Mexico and Guatemala and a trip to China was in the planning.) He returned from every trip brimming with experiences and stories, fascinating travel logs and bearing special gifts for the family and friends. Neev-Ya's commanders eulogized the period in which he served as an aeronautical engineer in the air force in the following way:"Neev-Ya, you joined the department in autumn 1999. Just three and a half years and so much carries your name, so many achievements that you were part of that bear your signature. You implemented numerous changes in airplanes. These changes contributed directly to strengthening the air force that you loved so much and to fortify the security of the State of Israel that you were so proud to be part of. You also excelled in the social aspect. You were the central axis of the young division, the main star of special evenings. You bonded a group of young people who traveled and went out together…you have within you the soul of an engineer and the sensitive soul of an artist… you possess an amazing fusion that is only you, a combination that turns you into a whole and perfect human being." Among the writings that Neev-Ya left behind were a multitude of ideas and dreams for the future, including a list of challenges for prospective "TechoBrain" Competitions. Additional ideas are the "Koflan", a plan for a special city in the Negev named "Nogobo", the "Picasso Project" and thoughts about writing books. His friends say that "a concept of time exists in the world and then there is "Neev-Ya time"…none of us knows exactly what it is to get the most out of life, but it seems that Neev-Ya knew precisely." The family eulogy at the funeral ends with the lines, "Our Neev-Ya, your last photograph taken just a few hours before your death in which you look happy, smiling and at ease in the heart of a field of flowers in Nahal Habsor, will be treasured by us forever. You walked like a prince among us and also now Neev-Ya, you are towering high above us. Your image and values in which you believed are constantly with us and we promise you that we will treasure them so they continue to be a source of inspiration that shines on our lives. The love with which we surrounded you will not fade and you will forever remain Neev-Ya, our one and only special fruit of G-d."
Neev-Ya was an academic reservist student in the Aerospace Engineering Faculty at the Technion. When he and his friend suggested "to change the dull exterior walls of the faculty building" and to paint something colorful and big that would break up the dominate academic grey of the building. A picture was drawn on a 20 square meter wall opposite the classrooms depicting the progress of aviation from the Wright Brothers' airplane up to the F-16 Jet. Neev-Ya completed the drawing by himself over a period of one year in the midst of studies, tests, hobbies, work, personal commitments and the army. Following his murder on Saturday, the 4th of Adar Bet 57633, 8.3.2003 while he was an officer in the air force and a Master Degree Student in the Department of Bio-Medical Engineering, the following lines were added to the painting: " And Heaven suddenly blackened" taken from a poem by Rabbi Shimon Ben G'virol. During Succot (the Feast of Tabernacles) in 2003, the painting underwent a preservation and framing procedure. The words "of blessed memory" were added next to his signature and the painting was dedicated in Neev-Ya's memory. The Neev-Ya Forest was planted by his friends in Nahal Habesor, the site where Neev-Ya (of blessed memory) spent the last day of his life on Saturday, March 8, 2003. The forest was dedicated on April 15, 2004 in a special ceremony in which eulogies were made by his commanders, friends, representatives of his high school and family members. Following a hike along the route that he had planned, a memorial stone was unveiled, balloons were released and 26 saplings were planted symbolizing his age the day his life was uprooted. By the coming winter, 1,000 plants will have sprouted up and in another few years, we will be able to take hikes in the thick of a real forest. Thus, in the last place where he treaded, the forest symbolizes one of Neev-Ya's most outstanding character traits - giving meaning to life through a vision of hope for the future. The "TechnoBrain" Competitions have become a Technion tradition in memory of Neev-Ya and take place every year in the spring. The challenges facing the students reflect Neev-Ya's vision :"the competitions were conceived in order to give the students a release from their textbooks, laboratories and computer screens. This facilitates creative expression while dealing with a competitive challenge of complicated engineering problems." The third competition, "Bullhit" was chosen as the opening event of the 80th anniversary celebrations of the Technion on May 2004. Like all the prior events, the happening was exciting with an attendance of thousands of students and representatives of the media. The upcoming competition, the "Pesachologia" is scheduled for April 2005 and will combine engineering logic with topics from the Passover (Pesach) holiday. The subject of the first competition, the "EggCopter" is the central theme of the book "Kofiko in the EggCopter Competition" written by Tamar Bornstein-Lazar (2000). The panel of final projects presentations of aerospace engineering students, was dedicated in memory of Neev-Ya in 2005 at the 45th "Israeli Conference of Aerospace Sciences".